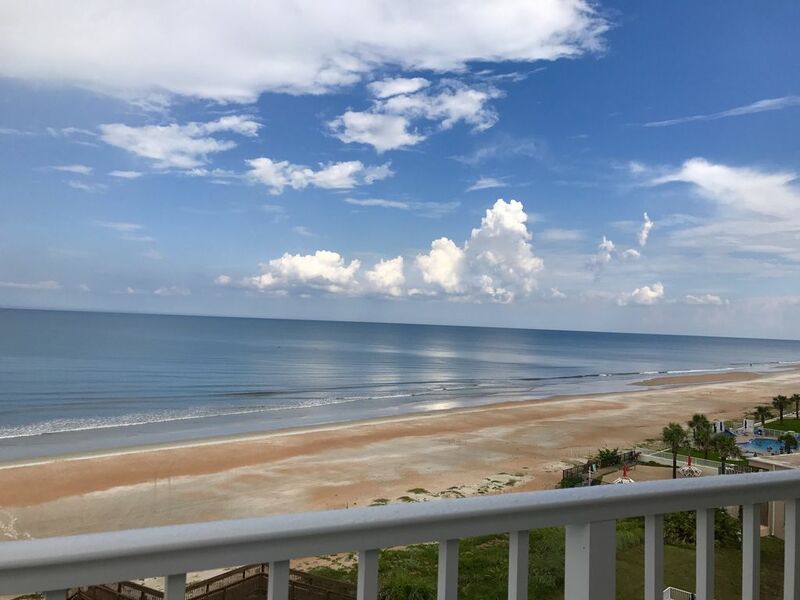 Blue Serenity by the Sea, in the sought after updated Seawinds building in beautiful Ormond Beach, Florida. Renovated in November 2017, this unit has all of the comforts of home, away from home. oceanfront condo is the perfect choice for you. 1995, it is one of the newest condos in Ormond Beach. master bedroom suite, living room, kitchen, and breakfast nook. tastefully appointed. 80% of our bookings are repeat guests! Quiet beach with easy access. Beach chairs and umbrella available inside our unit for use or guests can use the chairs located on the walkway to the beach. Direct oceanfront unit. No road to cross. laundry area located behind closed doors inside the unit. One designated parking spot in the parking garage. Additional parking on the main level of the building. Breathtaking views, decorated beautifully and had the most wonderful time!! Thank you so much, we will be back!!! Catherine was amazing from the initial contact! Condo accessibility was easy and as described by owner. Catherine’s hospitality was next to none- even gave cell number Incase we needed anything during our stay. Condo was very spacious, clean, and comfortable! The view was breathtaking on an empty beach. Had so much space which was wonderful for our toddler. Our favorite part was hearing the sound of the ocean from our bedroom as we slept at night (we miss this already)! Condo was stocked with ANYTHING and everything you would need. It was nice to do laundry before we headed home. Also had beach chairs and umbrellas for renters use which was very appreciated as we drove from WV. Condo is close to grocery and tons of delicious eateries. Drove to Disney one day- only 1.5 hours away. Before we left we tried to book next year during my husbands spring break and unfortunately already booked. We can see why renters keep returning- beautiful, amazing views and location, and so affordable! More than your moneys worth. Does not disappoint! We will be back. Thank you again Catherine! We had a great time at Seawinds in Ormond by the Sea. The condo was great, very comfortable and had everything we needed. Easy access to the beach and pool. The area had a lot of stores and restaurants yet very close to more in Ormond. We use to live in Ormond By the Sea! Very nice to come back and visit with friends. Would recommend this beautiful home. Awesome view! Beautiful beachfront end unit condo with amazing ocean/ beach view. Condo was nice and clean. Fully stocked with everything you need. Easily fits a family of four with room to spare. Pool is beachfront and convenient to beach. The whole complex is clean, easy to navigate and convenient. Loved the drive under garage. Thank you for a wonderful stay! We will definitely be back! It was like being at home. Cozy quiet beautiful. are excellent restaurants, supermarkets, banks, pharmacies and specialty shops. There's also an urgent care and hospital located within minutes of the unit. fishing and of course, long, relaxing walks on the beach at sunset. Beach International Airport is just 10 minutes away, historic St.
gentle ocean breezes. Your oceanfront home away from home.